Busy Season – There’s money to do a new website but – no time. Off Season – There’s more time to do a new website but – no money. Solution? – Start Now – We’ll use the time while you are busy to get a lot of the technical details done. Before you know it, you’ll have a fabulous new website in time to launch in August, September or October. Maybe even earlier. Look at these 4 expensive hotels & their websites to see what is possible. https://www.lafondasantafe.com A lot goes into a high performing website and buying behavior revolves completely around the online experience — great Design, Functionality and Conversion. https://theironhorsehotel.com/ Note the collage on the home page. It’s exceptional in showing people having fun. https://www.badruttspalace.com/en Wonderful job in showing the history and the “hip” – $395/ night. http://hoteljackson.com/ Note the booking options above the fold on every single page. 3 ways to book. Click the booking button, call, or enter email booking with dates. It’s amazing just how fast an innkeeper’s new website pays for Itself. And that means the site has generated many additional reservations within a very short period of time and thousands of dollars more in income. 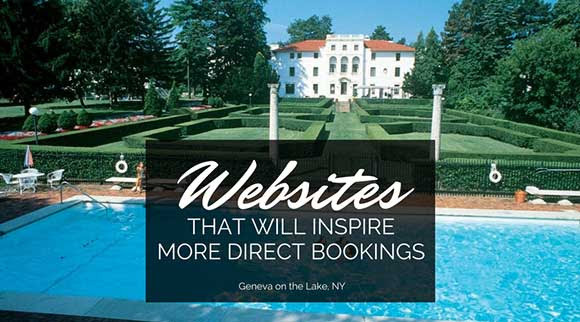 A well-designed site convinces visitors that booking on your website is the best option they have!